Hi everyone! Here comes a lollipop card I made for a friend of mine. I have used some lovely papers from the Vintage Summer Basics collection. Here comes some photos I took a lovely Summer day. To make the card, I first start by folding two accordions 30 x 7 cm. I fold at every cm. Then I glue the two papers together and get a long accordion. And after that I make a circle with it, by gluing it to a paper underneath. All the gorgeous flowers was a gift from Petaloo some time ago. I got so many flowers, that I still have many left after making some projects for their cooperation with Maja Design. The butterflies are cut out from the pattern paper (Vintage Spring Basics). The image is coloured with Distress Ink. Some secret envelopes. Made from a Magnolia die, using beautiful papers from Maja Design. 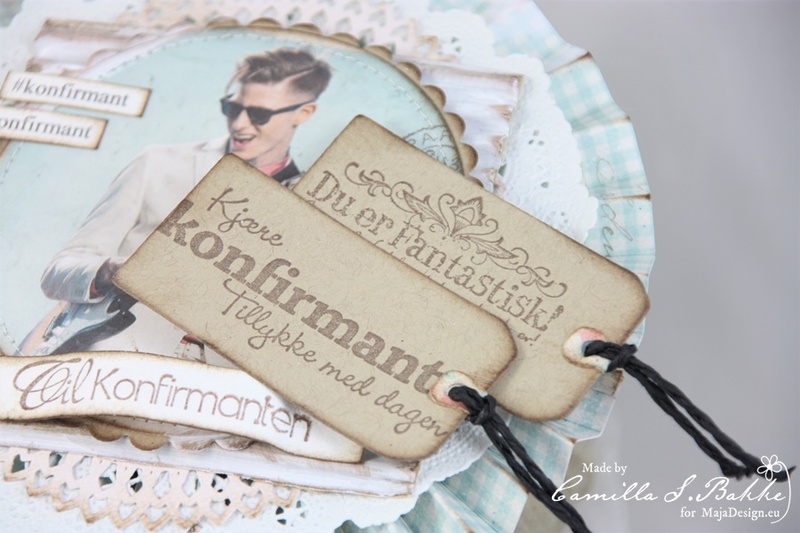 The text (from Stempelglede) is embossed on craft paper (translated: Have a lovely birthday). Hi everyone! Here I am with some confirmand cards for boys. I have used the fantastic Denim & Friends Collection! Firstly I have two cards. I have cut out the shape of the vest, and used a Sizzix die for the bow. 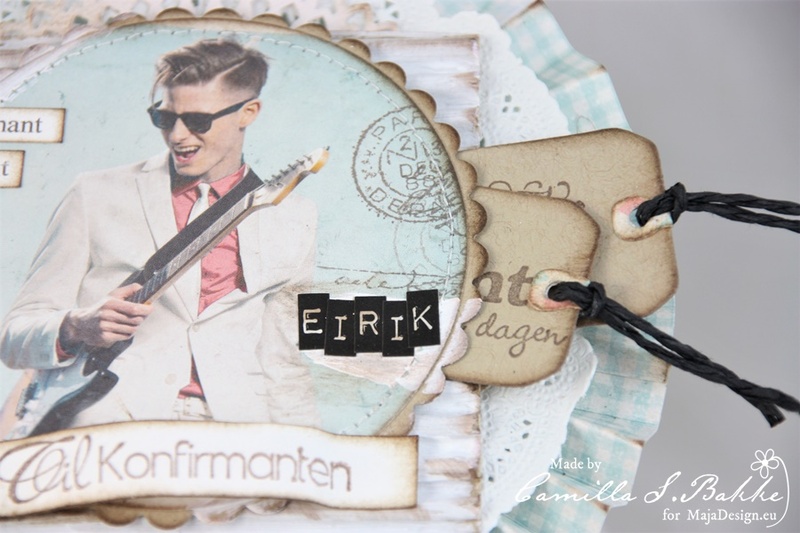 The text stamp is from Ett Trykk. As my pupils are all Confirmands this year, I made them all a card. I have painted with some white gesso here and there. I also made some lollipop cards for two of the boys. Here you also see how I decorate the back of the lollipop cards. And here is the last one I have for today, the book card. A colleague of mine gave it to her son. I made the front like the cards. And here is the inside of the book card. I have used many of the Denim & Friends papers, and also the monochrome papers. Thank you so much for visiting the Maja Design blog today! Hi everyone! 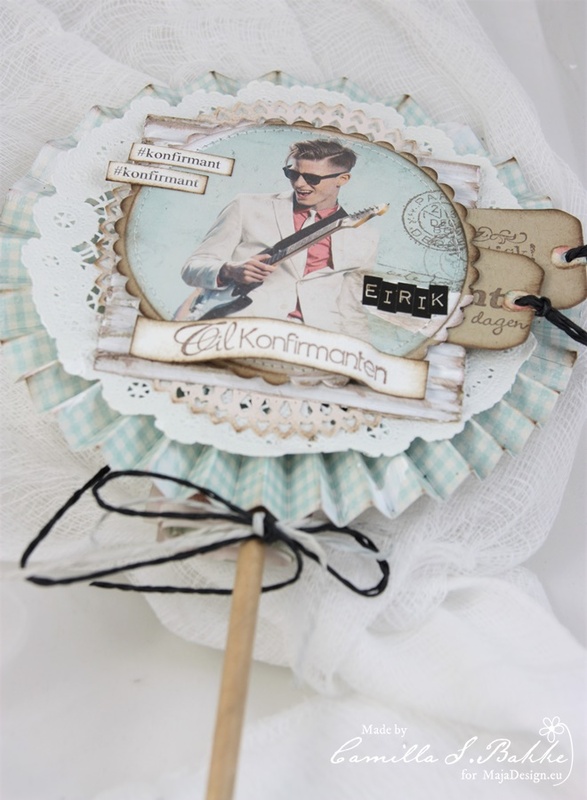 Here I am back with a confirmand card using the lovely Summer Crush papers. With doilies and a straw. It is Confirmand-time here in Strandebarm now. And here comes one of the cards I have made. I just love the images in the Summer Crush collection. And this is just so beautiful and dreamy. And a perfect match to the papers. 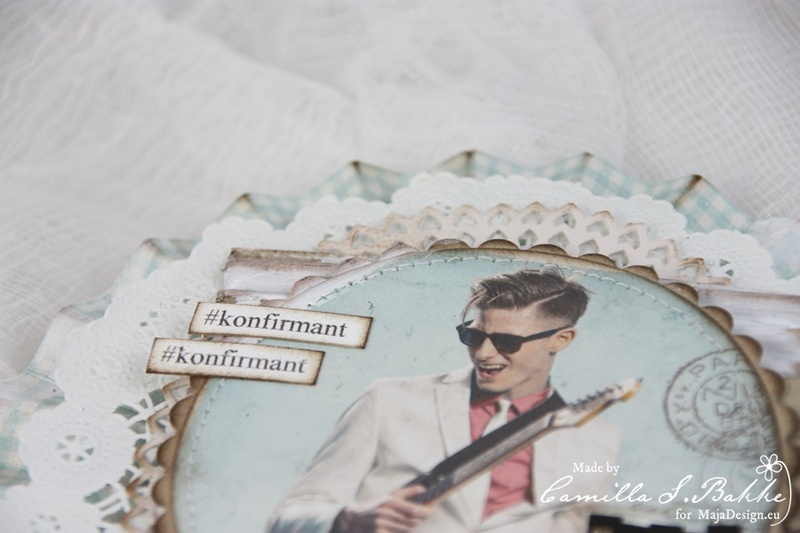 I have cut out the “Konfirmant” text with a die from Papirdesign using the Maja dotted paper. The flowers are from Petaloo and Wild Orchid Crafts. I have places sissal grass behind them. And some cheese cloth behind the image. 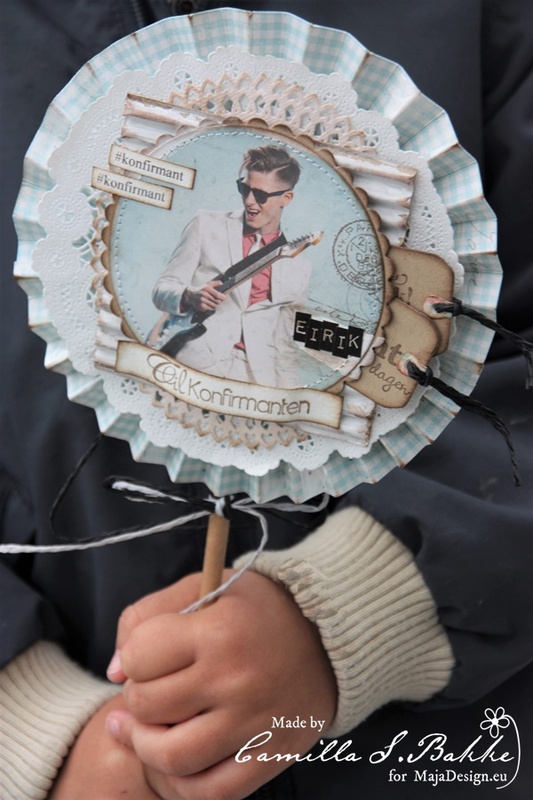 And here is the back of the lollipop, to write a greeting on. I have made a lollipop card for today’s post. And I have used beautiful papers from The Celebration Collection. The flowers are from Wild Orchid Crafts, image from Magnolia and the butterflies and text are made with a Stempelglede stamp. I have coloured the image with Distress Ink, re-inkers. I have made an accordion and glued it together into a circle. Then I have added layers with pattern papers and doilies. Here comes a Confirmand card I made to my friends son. And I have used papers and image from the Summer Crush collection for this one. I think the papers have really sharp and cool colours, which fits sporty young people 🙂 It is my son (three years) who is holding the card on the photo above. The lollipop cards ar fun to make, and they are faster to make than my ordinary cards. Here comes a closeup. Tags from Magnolia with texts from Stempelglede. The text #konfirmant is written on my computer and printed out. I have used my sewing machine and sewed the paper edges. They are also inked with Distress ink – reinkers. Thank you so much for visiting the Maja Design blog!